Nerf like 2" Micro Volleyball. 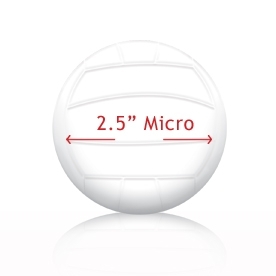 Our 2" Micro volleyball is excellent to promote a large sports event, trade show, store opening, sales meeting. A great band, team spirit fund raiser and pep rally give-a-way. Autographable balls for use as a marketing tool or gift. Cheerleaders, sponsors or school booster clubs can throw it into crowds. For children, teenagers, adults. Union made in Mexico with all USA made components. Comment: New set ups required for reorders beyond 1 year from prior order. Full color prints only on White backgrounds.